“Enabling children with disabilities to fulfil their potential”. 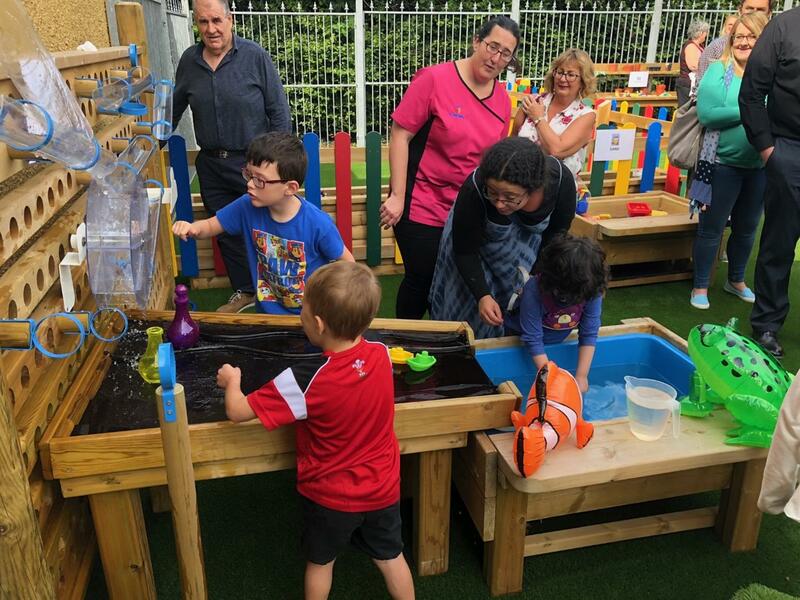 Y Bont is an independent local charity that provides specialist provision and child-centred support for children with a disability or complex medical condition, to encourage them to learn and play. 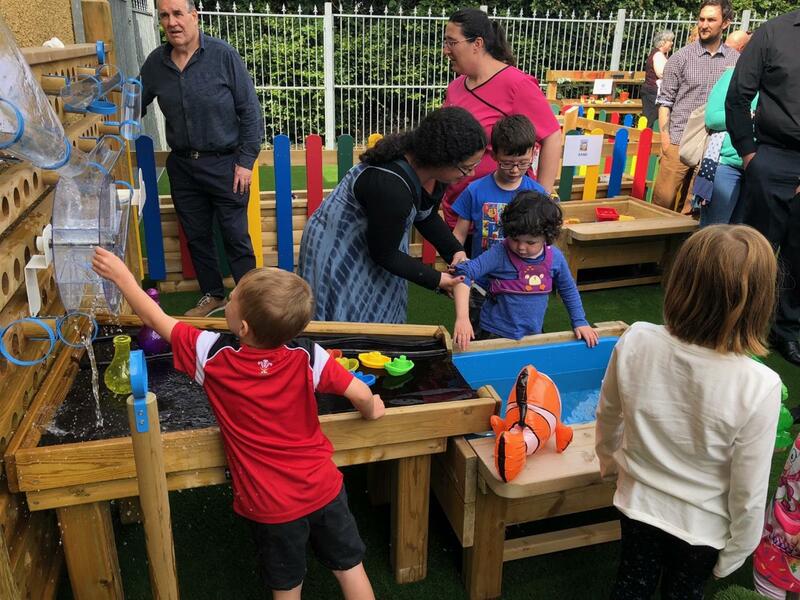 Over the course of three years, our Playground Consultant and SEN specialist, Becky Hazell, has worked closely with Y Bont; their Nursery team and Occupational Therapists to design and deliver a bespoke and breathtaking outdoor learning environment. It was a privilege to work on this project with Y Bont, and to develop a greater appreciation for the incredible support they offer to the families of children with complex needs. The playground renovation was funded through a company called Freudenberg, who also supported Y Bont by preparing the playground ahead of our installation. 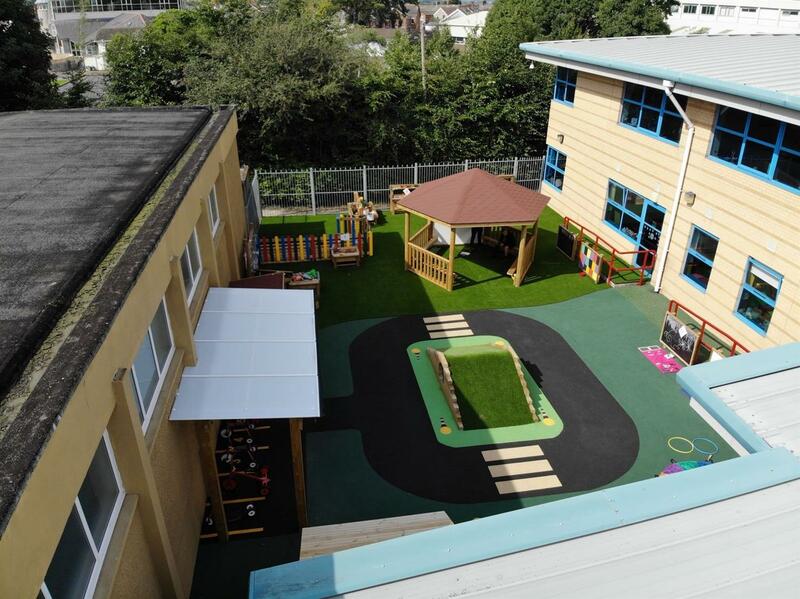 We used a combination of vibrant Artificial Grass; which delivers an all year play surface for children to learn and, impact absorbing Wet Pour to create a safe and visually stunning playground for the children. 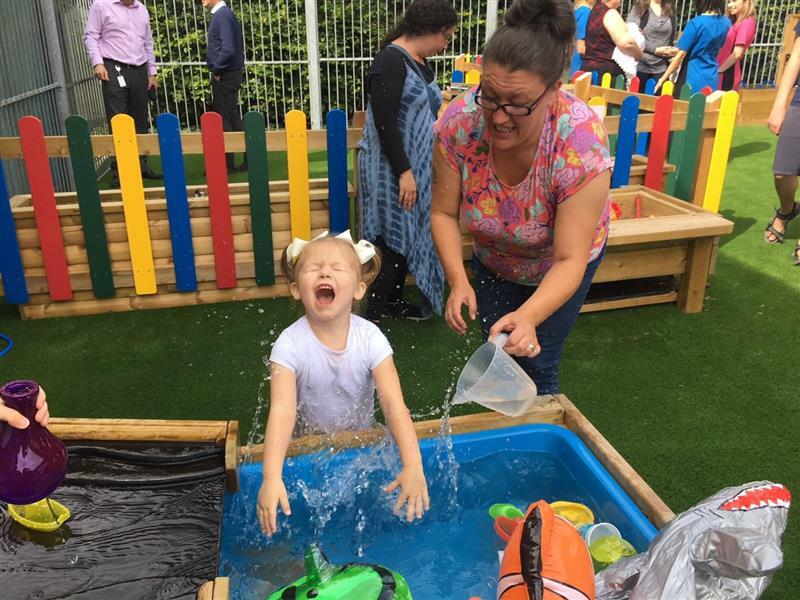 Becky worked closely with Y Bont to create an adventurous, tailored and wheelchair-friendly outdoor play setting that support occupational therapy and encourage learning and development at all stages. One of our main aims was to encourage sensory play to improve desensitisation and sensory development through messy play. The play environment includes; water play to inspire exploration and discovery through; look, feel and texture. Our Mud Kitchen was installed to allow children to use their imagination and delve further into explorative learning, whilst encouraging teamwork and social skills amongst peers. The planting area allows children to explore their natural environment, learn about different materials and supports understanding of how plants grow. The addition of mark making boards, and a music and movement area offers children with a physical outlet to let their creativity and imagination flow. These can also be used as resources to teach. View our range of sensory play resources here. The height of all the equipment was adjusted to meet the unique needs of the children at Y Bont, and wheelchair space was well-thought-out to ensure that the playground was accessible to all. We installed an exciting climb through tunnel hill, beneficial in providing opportunities for physical development that support Occupational therapy and encourages the growth of motor skills. Children can practise crawling, rolling and they can glide over the bridge and go through the tunnel. Children can also practise balance and co-ordination by walking up and down the steps on the side. 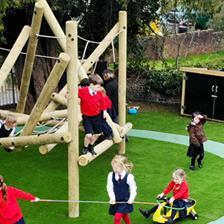 View our range of active playground equipment here. The addition of a gazebo at Y Bont offers a practical solution and protection from excessive sun and heat exposure or rain during play, or when teaching outdoors. It has been our pleasure to work with Y Bont and we have thoroughly enjoyed creating a special playground for exceptional children to enjoy! 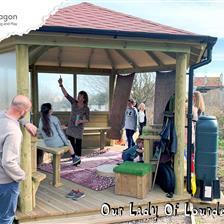 View our range of Outdoor Classrooms here. If you are looking to create a fun and adventurous playground environment for children with special educational needs, Contact Us to speak with one of our SEN experts. 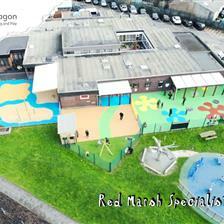 You can view our amazing range of products for children with Special educational needs here.